Located on the historic Piazza della Repubblica, the Hotel Savoy Florence is just steps away from the Duomo (Florence's renowned cathedral), the jewelry shops of the Ponte Vecchio, the fashion houses of Via Tornabuoni, museums, and galleries. When you're on vacation you shouldn't have to settle for a great hotel in a less-than-great location. Staying at the Hotel Savoy Florence is a no-compromise proposition. It brings you the best of Italy along with exemplary comfort and hospitality. The art and history of Florence are enough to keep you out all day, but the charms of Hotel Savoy will entice you back every evening. Recently renovated, the new lobby is a fluid and white space punctuated with colorful art and design elements by Pucci. Each of the 80 rooms and suites have been designed to enhance the hotel’s timeless elegance. The 30 suites have been completely restructured and expanded, offering guests a more luxurious experience. Among them the Grand View Suites and the new impressive Duomo Presidential Suite - which occupies its own wing with stunning views of the dome - are exclusive retreats from the bustling city below. The concierge can arrange personalized trips to the Uffizi Gallery or the Chianti region for an afternoon of wine tasting. Or, sample the delights on offer at Irene. The dishes, created by Celebrity Chef Fulvio Pierangelini, are made with local and seasonal raw ingredients and recall the richness of traditional Tuscan cuisine. Or you can just soak up the ambience on the Piazza. Florence abounds in life's finest things, and you can find many of them right at the Hotel Savoy. Send an availability request with your requested dates to the Hotel Savoy. Our elegant Classic rooms mix the Renaissance heritage of Florence with the contemporary modernity of the hotel. Deeply comfortable queen-sized or twin beds are complemented by warming Tuscan-inspired fabrics and traditional parquet floors. The well-appointed marble bathrooms are stocked with our exclusive Forte Organics toiletries. Views are of the charming historic center of Florence. Connecting room options are available. 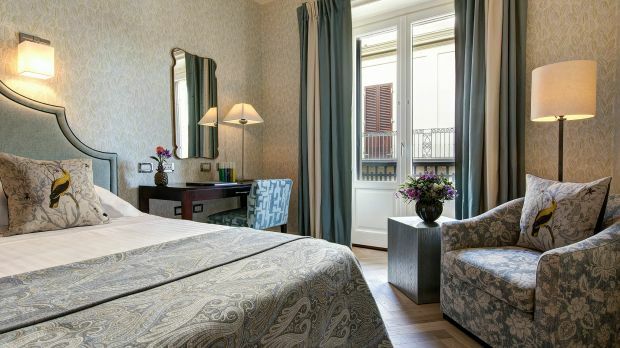 Our Executive Double rooms reflect the refined elegance of Florence. The luxurious queen-sized or twin beds are covered in soft blankets. The carefully curated furnishings mix the antique with the new, drawing on local design talent. There are charming views over the historic centre of Florence, and the marble bathrooms come complete with exclusive Forte Organics toiletries. Features a TV with interactive entertainment, in-room bar, in-room safe, complimentary Wi-Fi Internet and tea & coffee making facilities (upon request). The Piazza View rooms stand out with their spectacular vista over the comings and goings of Piazza della Repubblica. The bright and colourful décor of the rooms is complemented with contemporary furnishings and incredibly comfortable queen-sized beds. The mosaic-tiled bathrooms, with marble bathtubs, come with our fine Forte Organics products. Connecting room options are available. The lavish Deluxe rooms come with supremely comfortable king-sized beds and stylish sitting areas with modern Florentine furniture, such as bronze coloured work desks and bookshelves filled with classic novels. The rooms have fascinating views over the Piazza della Repubblica or the historical centre of Florence, and opulent mosaic and marble bathrooms, filled with our exclusive Forte Organics bath products. Connecting room options are available. Connecting room options are available. Junior Suites look directly out over Piazza della Repubblica, with impressive views of its historic porticos. Their contemporary design is enriched with stylish Italian furniture and Tuscan-inspired fabrics, with deluxe king-sized or twin beds, and a comfortable living area. The new bathrooms, finished in marble and mosaic, feature a walk-in shower and come with exclusive toiletries by Forte Organics. Executive Suites are elegant yet modern, with a refined mixture of contemporary design and artworks inspired by Florence’s cultural heritage. The spacious suites are separated into two distinct areas: a sitting room filled with carefully curated local furnishings, adorned with glamorous silks and velvets from top Italian designers; and a stylishly-decorated bedroom with light yellow, arboreal wallpaper and a deeply comfortable king-sized bed. The bathrooms are finished in Italian marble and come with our exclusive Forte Organics toiletries. Some feature double washbasins and separate bathtubs and showers. Views are of the charming historic center of Florence. Connecting room options are available. The two-storey Panoramic Suite offers enchanting 180-degree views over the city’s Renaissance landmarks. The elegant bedroom, located on the lower level, features a comfortable king-sized bed and a large sitting area with a cosy sofa and armchair. The ambience is enriched with Tuscan-inspired fabrics and carefully selected elements by local designer, Il Bronzetto. On the upper level, guests can relax and have a drink from the private fully serviced bar, while enjoying romantic views from the intimate terrace dominated by the panoramic view of Florence. The suite features two bathrooms: a master bathroom with a large walk-in shower and Italian marble and a separate guest lavatory. Both bathrooms come with bath products by Forte Organics. The Repubblica Suite playfully mixes Florentine heritage and modern interior design with a tasteful combination of antique furniture and contemporary artworks. It is positioned on the Piano Nobile, the second and most important floor of a Renaissance-style building, with three balconies offering spectacular views over Piazza della Repubblica. This glamorous suite has a large sitting room with high ceilings and fine parquet flooring to match. Guests can enjoy views of the Piazza from the master bedroom, where they’ll find a lavish walk-in wardrobe and king-sized bed with duvets made of soft Italian silk. Connecting room options are available. The Grand View Suites are extremely spacious, with a large sitting room and separate dining room providing stunning views over Piazza della Repubblica. Designed by Olga Polizzi, the suites are imbued with a floral, sylvan theme from the verdant, leafy wallpaper. Filled with Florentine artefacts and bespoke furniture from local craftsmen, the suites are softened with luxurious fabrics from celebrated brands such as C&C and Dedar. Each of the four Grand View Suites has a large classical statue from ceramicist Ceccarelli – one for each of the four seasons, reflected in the putti sculptures downstairs. The suites feature a main marble bathroom with separate bathtub and shower, double washbasins and a separate guest lavatory. Connecting room options are available. The Duomo Presidential Suite is a large two-bedroom suite occupying its own wing of The Savoy. A distinctly Florentine aesthetic, the suite is opulently decorated with bronze tables and gold leaf mirrors made by local designer, Il Bronzetto. 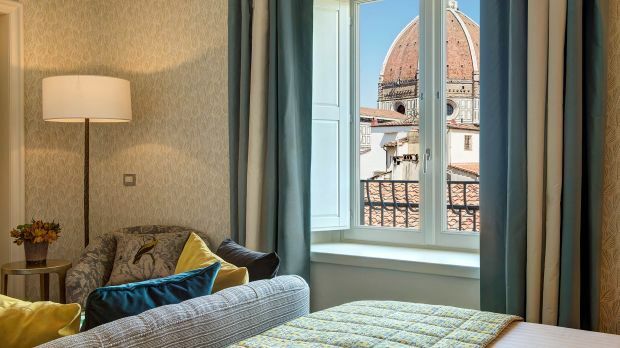 Large windows let natural light flood the rooms, and provide splendid views of Brunelleschi’s stunning Duomo. The turquoise colour palette and sylvan wallpaper are accentuated by handmade paisley patterned blankets in fine Italian fabrics, which sit atop the magnificent king-sized bed. The living room features bespoke book cases from Castorina, filled with works by Italian authors, and playful Timorous Beastie-covered cushions. In the dining room, guests can enjoy a drink from the private fully serviced bar. The Carrara marble and mosaic- tiled bathrooms have separate bathtubs, walk-in showers, double washbasins and luxurious Forte Organics bath products.